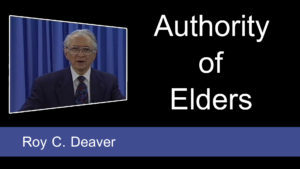 What is an elder? 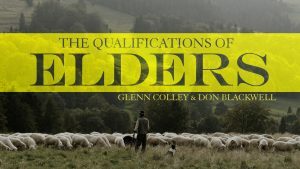 What does the Bible say about the qualifications and roles of an elder? It is God's desire for every congregation of His people to have elders. However, not just anyone can serve as an elder. In this series of lessons, Don Blackwell and Glenn Colley sit down with open Bibles and answer these important questions. What are the qualifications to serve as an elder? In 1 Timothy 3 and Titus 1, God has laid out specific qualifications for men who would serve in this role. In this lesson, Don Blackwell and Glenn Colley open the Bible to address the qualifications of being "blameless," "the husband of one wife," and "temperate." What are the qualifications to serve as an elder? In 1 Timothy 3 and Titus 1, God has laid out specific qualifications for men who would serve in this role. 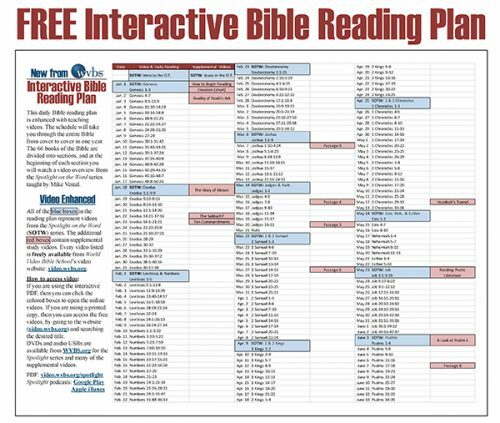 In this lesson, Don Blackwell and Glenn Colley open the Bible to address the qualifications of being "sober-minded," "of good behavior," "hospitable," "able to teach," "not given to wine," and "not quarrelsome." What are the qualifications to serve as an elder? In 1 Timothy 3 and Titus 1, God has laid out specific qualifications for men who would serve in this role. 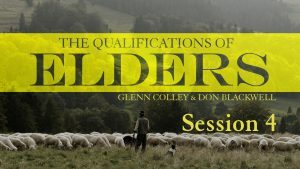 In this lesson, Don Blackwell and Glenn Colley open the Bible to address the qualifications of being "patient," having "obedient children," "not covetous," "not a novice," "of good report," and "a lover of what is good."